Mitt Romney, the successful businessman, presidential candidate and father, is no stranger to navigating public relations. Recently speaking at the Silicon Slopes Tech Summit earlier this year, I gleaned several wise lessons that not apply to working in the public relations field, but to life in general. Romney, who was interviewed by Alex Dunn, president of Vivint, at the summit, was asked a variety of questions ranging from business advice learned while heading up Bain Capital to work-life balance advice gained from decades in both the business and political worlds. Here are four of my favorite pieces of advice that apply perfectly to the world of public relations, specifically owning your mistakes, respecting parental advice, grabbing the reins, and fiercely protecting your work/life balance. As a young businessman with a failing company, Romney had no choice but to be brutally honest about his company and its dismal financials. When he knew he couldn’t make payroll, facing the facts allowed him to find a solution that not only saved him, but allowed him to build a great team. His first step was to call his landlord and put a stop-payment on the rent check. It takes humility to admit you can’t pay rent, and it takes grit to do something about it — two essential components of owning your mistakes. His second step was to not fire his team. He knew that, in the long run, he couldn’t afford to fire people. Instead, he asked them to make a commitment to stay for at least a year. Keeping employees when your business is failing doesn’t seem like the obvious solution, but that’s one benefit of owning your mistakes. It forces you to be creative. So: owning your mistakes equals humility plus grit plus creativity and leads to superior results. “You have to have a vision,” Romney said. And he learned the necessity of vision from his father, George W. Romney. Himself a businessman-turned-politician, George Romney lived purposefully and made bold decisions. In 1955, George Romney was chairman and president of American Motors Corporation (AMC), the product of a recent merger. The company was struggling to compete with the Big Three automakers, so he made a bold decision: reintroduce an old car, call it the Rambler Ambassador, and phase out production of cars from the merged companies. This meant that the success of AMC would depend entirely on the success of the Rambler. The company only lasted 20 more years, but George Romney’s vision — including introducing compact cars before the Big Three did — certainly left an impression on AMC and the auto industry as a whole. “Be bold. Make bold decisions. Set bold goals,” said Romney, whose first car was a 1963 Rambler Classic. He has followed his father’s (and now his own) advice through his successful business and political career, so the advice seems to work! When the scandal came to light, organizers sought a new chief executive to take charge, and they chose Romney. 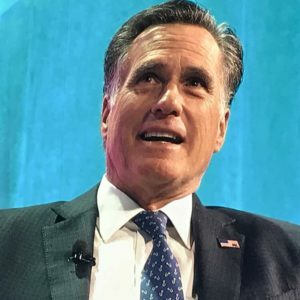 Some critics argue that Romney must have known his involvement and success with the Olympics would launch his political career, and some argue that the Games would have been fine without him. But that’s not the point — when you see a need and know you have the talent to step up and lead, you should do it. It’s not about what people think of you, but rather about the good you can do. Romney credits his healthy work/life balance to being totally focused in what he is doing when he was doing it. If he was at work, he was at work; if he was at home, he was at home. If he was on a work trip, he said he would even work in the hotel; the TV was never on. At home, he was immersed in his kids, reading to them, spending time with them. “Don’t work Sunday,” Romney advises. “Crises happen, yes, but normally not Sunday. When asked whether he would announce his run for Utah’s soon-to-be-available Senate at a Silicon Slopes event, Romney said he wouldn’t be making the announcement at the weekend event. “You only release bad news on Fridays,” he said. Why? Because as journalists and editors are heading home for the weekend, they won’t give the bad news as much attention as they would if it were released on another day. So if you want to avoid media scrutiny, publish your bad news on a Friday. Romney learned these lessons by testing them for himself. So own your mistakes, follow your parents’ advice, take the reins, fiercely protect your work/life balance, and only release bad news on Fridays. You will develop these PR skills and learn your own life lessons along the way.